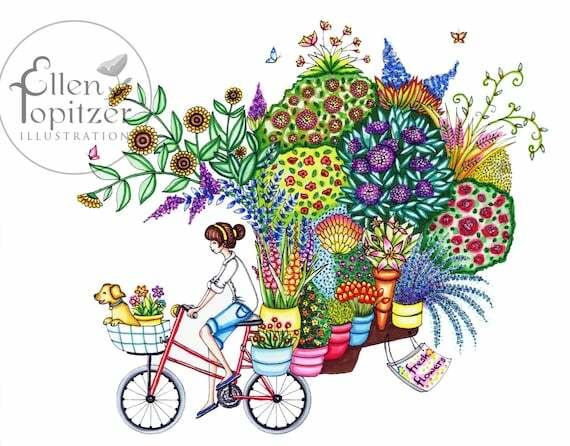 I kept seeing amazing illustrations in my Facebook Colorings groups where the books are not available on Amazon or Book Depository and it is quite distressing to see some of the beautiful colorings and not being able to see them all for yourself, then I found Etsy. Not only can you get the beautiful Japanese, Polish and European books from the Etsy shop owners but you can also get instant gratification from some of your favorite artists as they sell you downloadable PDFs that you can be printing and coloring in a matter of moments. 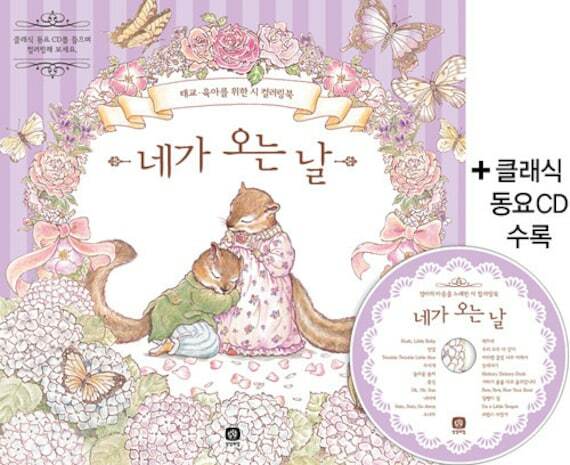 70 East Books is one of my favorite sellers of hard to find coloring books, they have Japanese, European, Swedish, you name it, over 300 gorgeous coloring books shipped to you from Korea. This shop has 851 sales with 256 5 Star reviews. 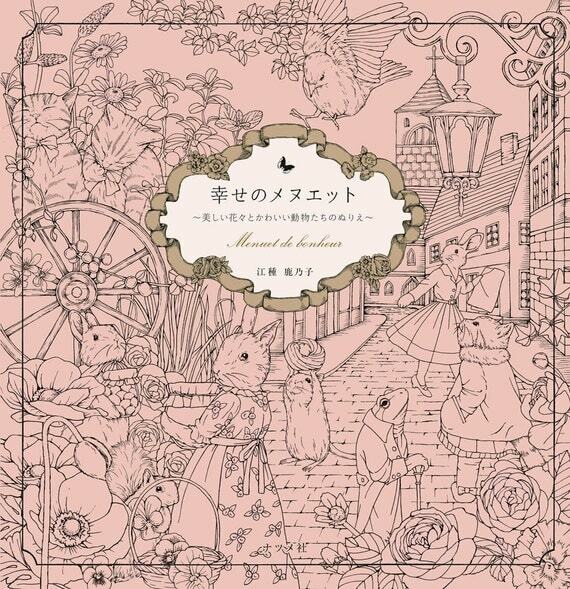 Kanoku Egadu The current coloring book I’ve been lusting over after seeing Chris Cheng coloring in it is Menuet de Bonheur Colouring Book by Kanoko Egadu or Rhapsody in the Forest II. I’m about to receive this book from the author so I will post a flip thru as soon as I can but in the meantime, you can take a look at the colored in images from this little gem on Instagram here. The book ships direct to you from the Czech Republic via her Etsy profile here. This book is also now available on Amazon UK. Klara messaged me this morning that she has been able to get her book Čarovné lahodnosti’s / Magical Delights in stock on Amazon US. Yes it is a bit more expensive than most books but I believe you will love it! 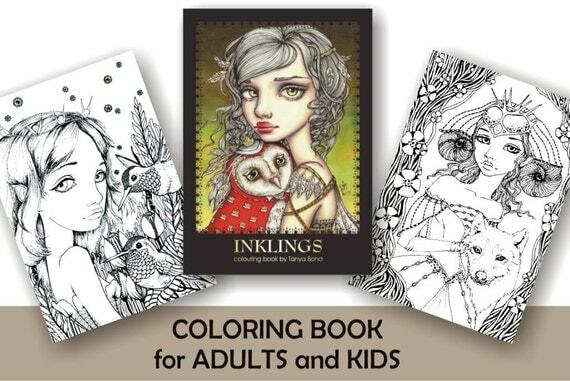 One of my first coloring books purchased was Tanya Bond’s Inklings via Amazon. While I adored her artwork, the CreateSpace paper just didn’t do it justice. I was thrilled to discover that she sells her books along with a ton of her art in both digital download formats as well as all of her coloring books on beautiful thick paper. I immediately ordered both. Tanya Bond’s artwork is incredible with her iconic big eyed girls most of which have their lovely animal friend as well. These books are printed on one side with gorgeous thick paper. You won’t be disappointed. YES, they are more expensive than on Amazon but if you are a paper snob like I am, it’s worth it. “Inklings 2” colouring book has 24 black line illustrations and a full colour cover showing examples of inklings in colour. The book is a big but easily manageable A4 size (a little under 9×12 inches) and has 150gsm pages that are stapled together with a full-colour cover into one beautiful colouring book. The images are printed on one side of the pages – the back of each image is blank. Click to order on Etsy. Ellen’s art is exclusive to Etsy with 8 original drawings available for only $1 each for immediate download by clicking here. This one is my favorite! Another from 70 Books East is “Mysterious world of the cat and his friends” Coloring Book. 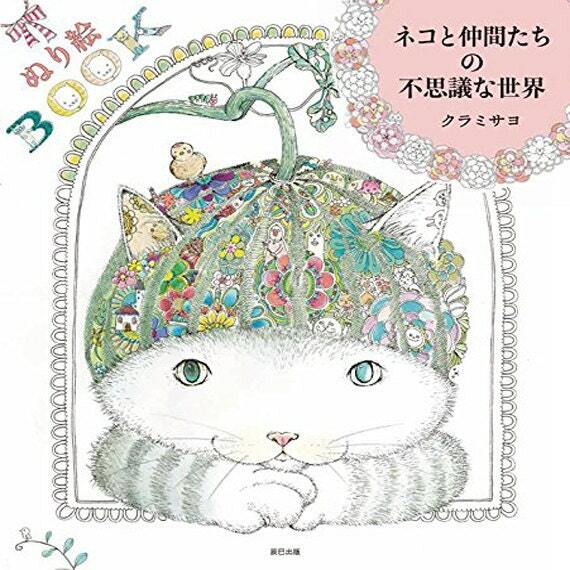 This Japanese Cat explores the strange world of Japanese artist Kurami Sayo. Take a look at this adorable images. There are many books to explore on Dover / Creative Haven Books and Book Depository so explore those options as well. It is highly recommended to the Hobby Lobby & Michaels App to your smart phone. That way you always have the coupons with you. You get free 2 day shipping every day at Amazon with Amazon Prime. You can try it for free right now. Your coloring posts are always so helpful, Chrissy. I hadn’t thought about selling my coloring book on Etsy. From what I see the art work is just beautifully awesome, I can’t wait to get there when I get a little better,I’m almost there I’m getting more talented to handle these prints I can’t wait! There’s another great artist on etsy. Masja van den Berg. I have her “Mijn wonderlyjke world” my wonderful world. Beautiful coloring book from Amsterdam.